Amtrak’s Train 11, the southbound Coast Starlight, makes a stop at Albany Station Saturday. 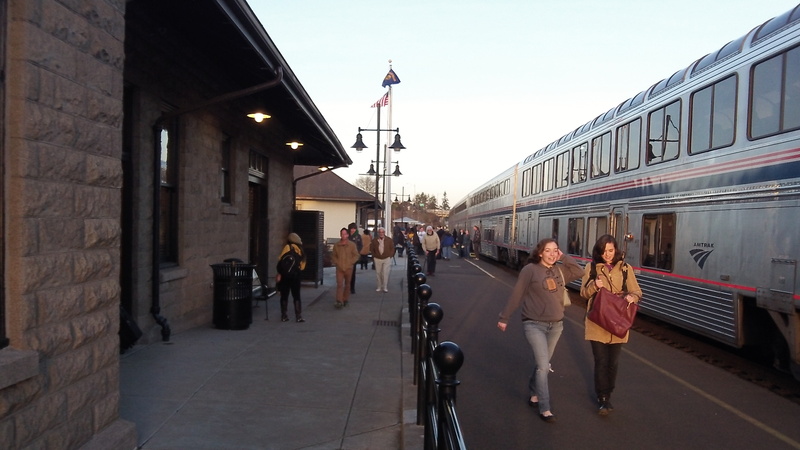 Things are happening on the passenger rail front in the Willamette Valley, one right away and the other in the indefinite future. Oregon’s two new Talgo train sets start revenue service on Monday (Jan. 6), when the number of southbound trains stopping in Albany on weekdays increases from three a day to four. In 2013 the Oregon Department of Transportation took delivery of two train sets the state had bought with federal stimulus money for $38.4 million. ODOT said another $6 million was spent on consultants, spare parts, testing and the addition of Wi-Fi. The trains have been named Mt. Jefferson and Mt. Bachelor. They join five others in use in the Amtrak Cascades Corridor between Eugene and Seattle. (Amtrak owns two of the trains and Washington three.) The new Talgos have seating for 275 passengers, a bistro car, a dining car, bicycle storage and business class seating, among other things. The new schedule adds a morning train from Portland to Eugene Monday through Friday. It leaves Portland at 6 a.m., reaches Albany by 7:36 and Eugene at 8:35. With buses and trains, the Cascades schedule now will have 10 daily northbound connections stopping in Albany. Going south, there will be seven daily stops, plus one on Mondays through Fridays and another on weekends and holidays. As for the possible future, the Oregon Passenger Rail Leadership Council has recommended to the Federal Railroad Administration that two route alternatives for faster train service get more detailed study. One route mainly follows the existing Union Pacific right of way, and the other follows Interstate 5 for most of the way from Springfield to Albany. At Albany, one alternative is to use the existing station and another is to build a new station near the freeway. Oh great, that’s what we need – more empty trains traveling up and down the middle of Oregon. I used to work right next to these tracks. Passenger trains would pass by a few times each day. You could accurately count how many people were on the train because they were so empty. But hey, let’s pour millions/billions more into trains that remain empty. Trains to nowhere – sidewalks to nowhere – I wonder how involved our mayor is in this fiasco? Actually she’s quite involved – she sits on a board that is heavily involved in trains and alternative transportation. The existing rail routes between Eugene and Portland reflect the wisdom and experience of railroad engineering personnel who knew how to move things by rail over long distances with a minimum cost and maximum utility to the communities they served. Passenger rail is one form of public transit that relies on stations being located in existing population centers. The alternate routes being explored would be avoiding those population centers due to construction costs and would be therefore less accessible to urban populations that generally make the greatest use of public transportation options. The existing Albany station has one specific weakness and that is a lack of expanded parking, although that could be addressed. One of the key factors in making rail travel the preferred option is ensuring that the last mile transportation options are available and appropriate for the passengers being served. The money wasted conducting the additional studies for less useful options could easily cover the cost of additional parking at the existing Albany station. I’ve used rail travel from the Albany station as an option to get to PDX Airport. I would have used it more often if there had been more trains available. I’m not an enthusiast of subsidized public transit system. Why? Because public subsidies involve a forcible transfer of wealth to a very small minority of transit users (and in the case of trains often a relatively wealthy user). If a private company or individual wants to build a transit system with their own money, without public subsidy, who knows, I might even choose to become a rider.